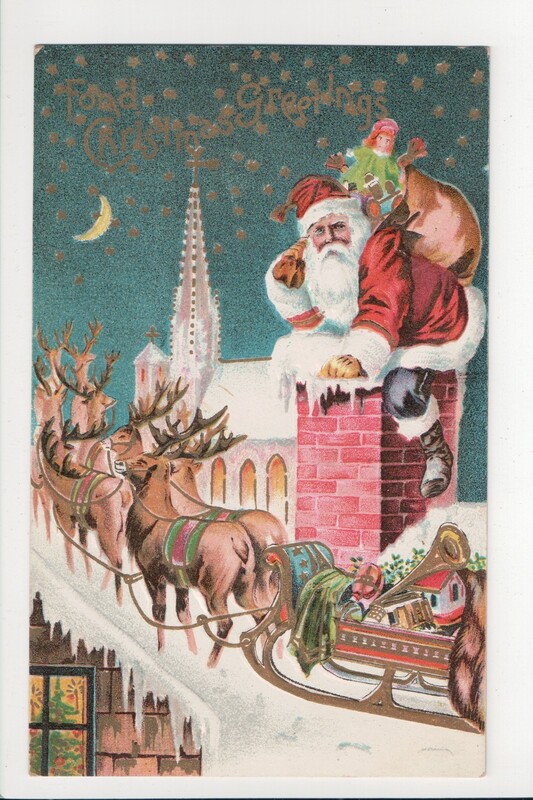 My grandfather was born in 1902, and as a small child was the recipient of many wonderful postcards, including a sizable collection of Christmas greetings. 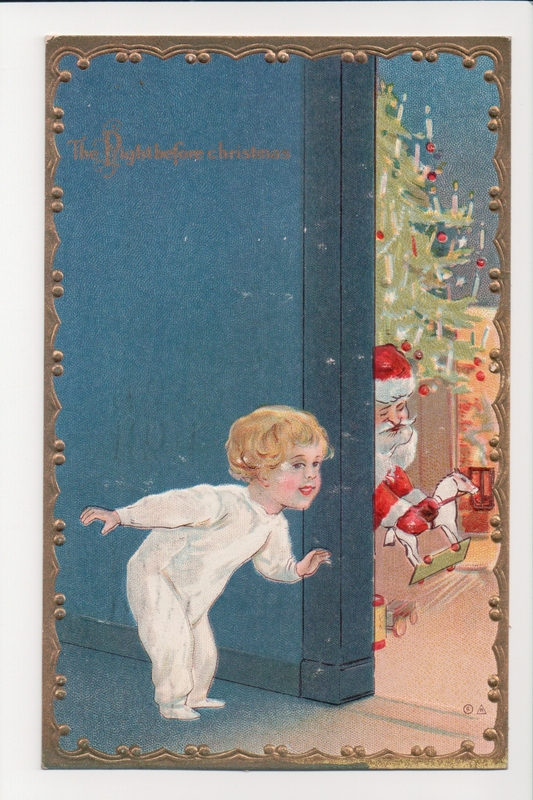 At least a third of this set portrays the night before Christmas, and specifically the visit from St. Nicholas. 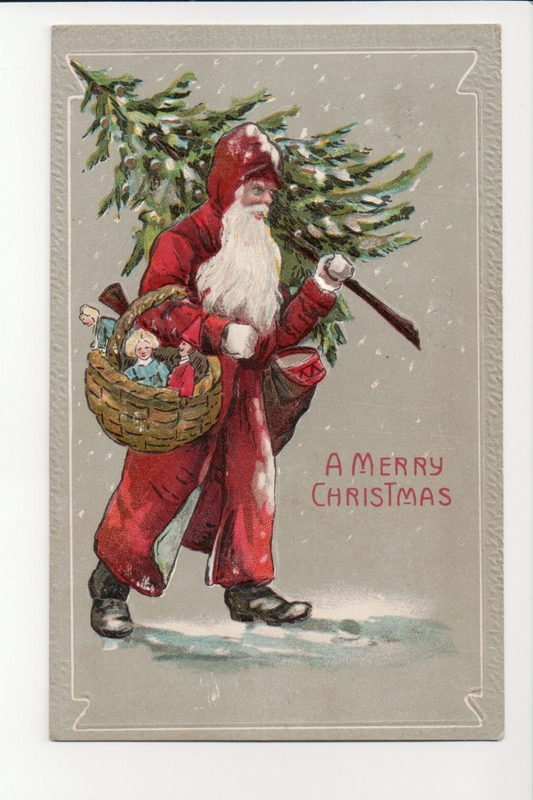 When I stand at a bank of Christmas cards today, any box featuring Santa will predictably show a jolly, plump, full-bearded man who is dressed in a red, fur trimmed suit. When I gaze at the cards sent to little Donald Minor, a variety of images are included, representing the diverse origins of the great saint and his gift-giving tradition. 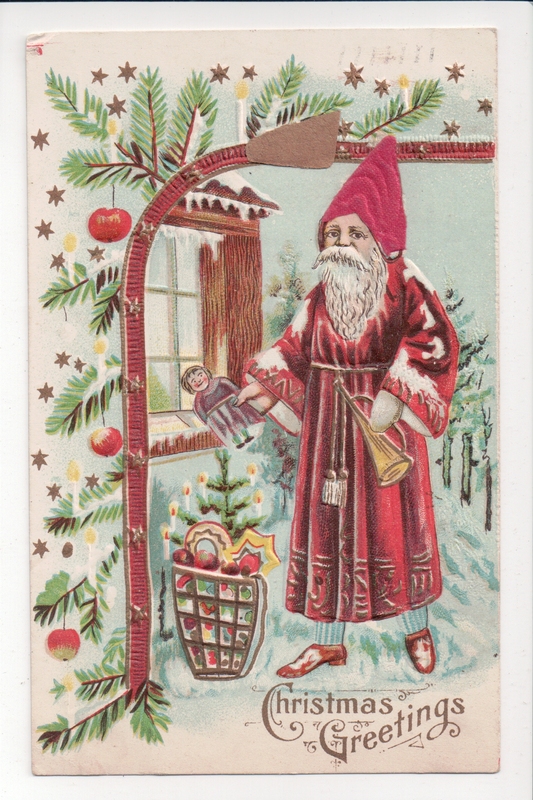 Several cards take the St. Nicholas tradition of walking from house to house and add some northern climate changes. This gift-giver must trudge through snow in warm fur robes and heavy fur boots. He is a rather stern looking old man, lean and weathered. 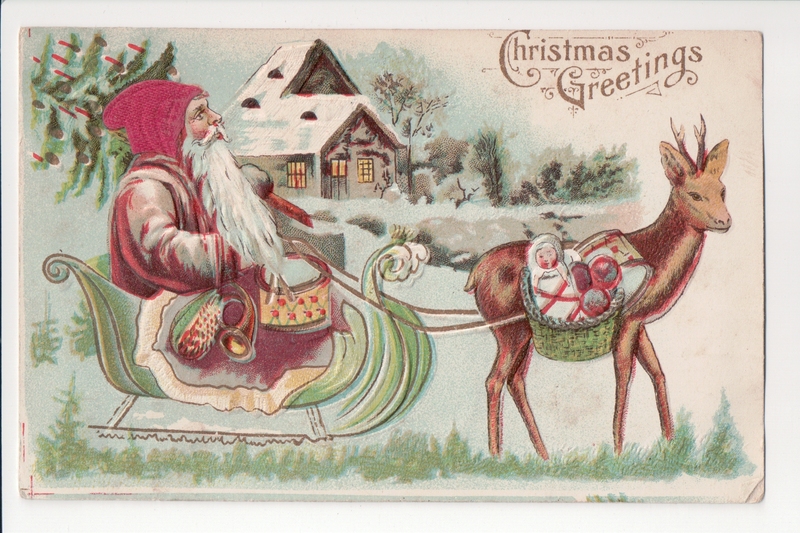 Another postcard portrays St. Nicholas delivering gifts from his reindeer drawn sleigh – which remains on the ground. The American version of the gift-bearing winter saint was most likely brought to the United States by Dutch settlers in eighteenth century New York. Sinterklaas – Santa Claus – wore a hat and smoked a pipe as he flew over treetops in his wagon to deliver children’s gifts on Christmas Eve. 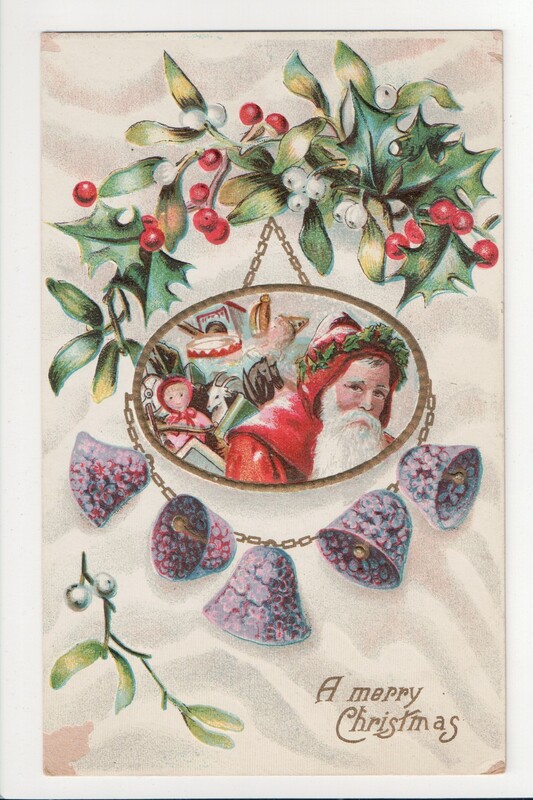 *¹ That image was expanded upon in Clement C. Moore’s instant classic, the 1823 poem A Visit from St. Nicholas, and entered the seasonal imagery throughout the Victorian era. 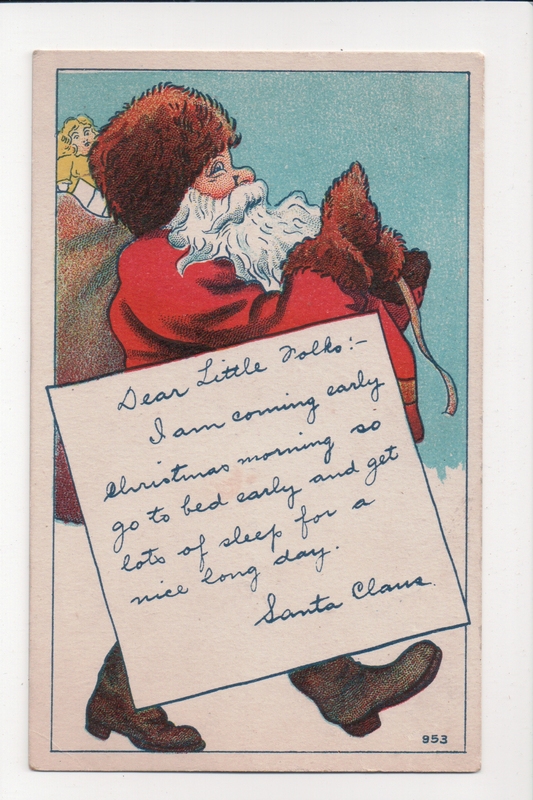 American publishers took advantage of the popularity of this Santa Claus when developing their holiday postcard designs at the turn of the 20th century. ‘Twas the night before Christmas, when all through the house not a creature was stirring, not even a mouse; the stockings were hung by the chimney with care, in hopes that St. Nicholas soon would be there. The children were nestled all snug in their beds, while visions of sugarplums danced in their heads; and Mama in her kerchief and I in my cap, had just settled down for a long winter’s nap – when out on the lawn there rose such a clatter, I sprang from my bed to see what was the matter. Away to the window I flew like a flash, tore open the shutters and threw up the sash. The moon on the breast of the new-fallen snow, gave a luster of midday to objects below; when, what to my wondering eyes should appear, but a miniature sleigh and eight tiny reindeer, with a little old driver so lively and quick, I knew in a moment it must be St. Nick. As the dry leaves before the wild hurricane fly, when they meet with an obstacle, mount to the sky, so up to the housetop the coursers they flew, with sleigh full of toys – and St. Nicholas too; and then in a twinkling, I heard on the roof the prancing and pawing of each little hoof. As I drew in my head and was turning around, Down the chimney St. Nicholas came with a bound. He was dressed all in fur from his head to his foot, and his clothes were all tarnished with ashes and soot. A bundle of toys he had flung on his back, and he looked like a peddler just opening his pack. His eyes how they twinkled! His dimples how merry! His cheeks were like roses, his nose like a cherry! His droll little mouth was drawn up like a bow, and the beard on his chin was as white as the snow! 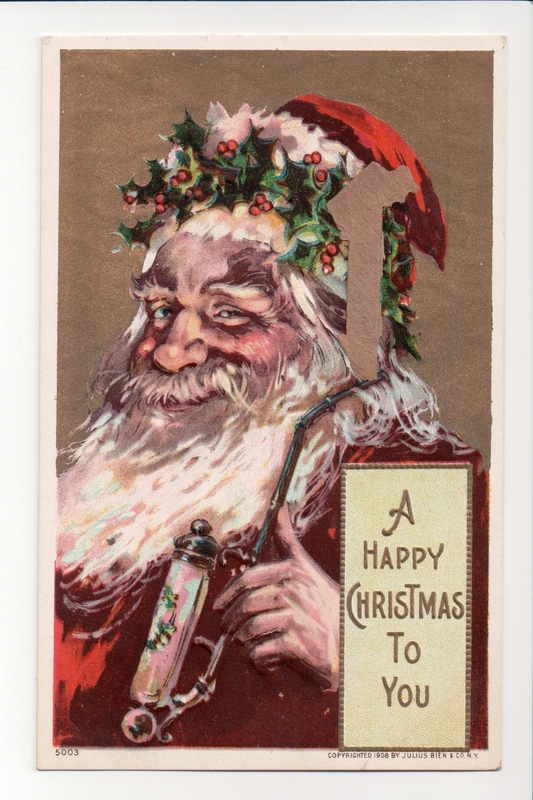 The stump of a pipe he held tight in his teeth, and the smoke it encircled his head like a wreath. He had a broad face and a little round belly that shook when he laughed like a bowl full of jelly. He was chubby and plump – a right jolly old elf, and I laughed when I saw him, in spite of myself. 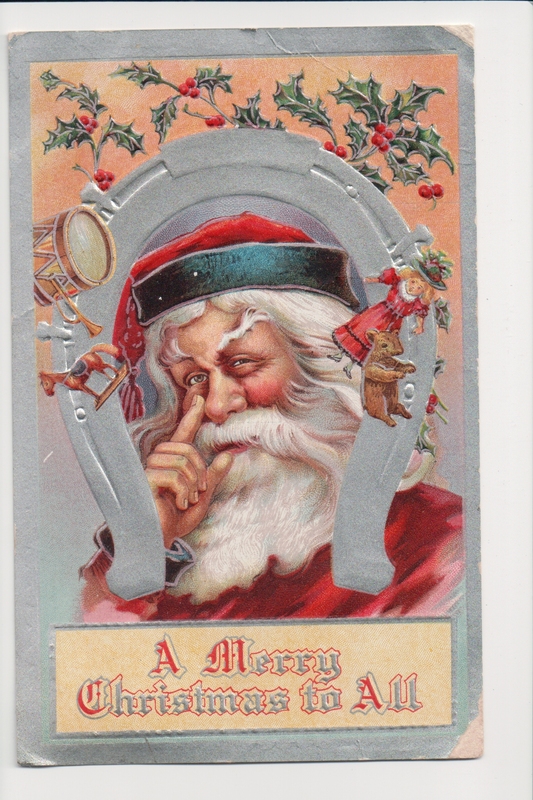 And laying his finger aside of his nose, and giving a nod, up the chimney he rose. *¹ Irving, Washington. A History of New York from the Beginning of the World to the End of the Dutch Dynasty. Philadelphia: Lea and Blanchard, 1812. 106-07. accessed on line December 21, 2011. *²Moore, Clement C. ‘Twas the Night Before Christmas. Philadelphia: Running Press, 1995. Next Article If I Could Send You a Happy New Year Card, It Would Be. . .
A Christmas gift to all of us. Thank you for sharing these. A delight to see. Thanks! Merry Christmas to you and yours! What a beautiful collection! Such a treat to see how this wonderful character is seen in other cultures. No matter the appearance, we will always love good ol’ St. Nick!